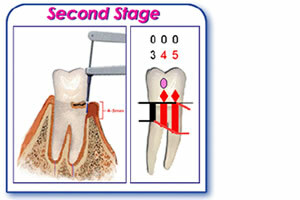 Following tooth extraction which could be the result of periodontal disease, fracture roots, abscess formation etc. the bone and gum around the removed root starts to shrink away. Research has shown that up to 40-60% of the remaining bone shrinks away within 2-3years. 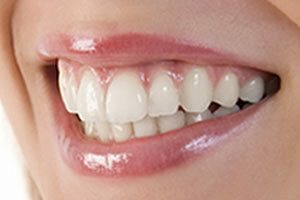 This leaves areas which areas which are unsightly because of the reduction of hard (bone) and soft tissue (gum) volume. This results in less than ideal final crown or bridgework in terms of size and shape compared to the adjacent natural teeth. We can offer rebuilding of this soft and hard tissue as we have had years of experience in providing these sorts of procedures. Should a patient request dental implants to replace these teeth than bone grafting may have to be done prior to any implants placed. The replaced teeth look odd as it maybe much longer and the gum around this tooth will also look sunken in. A procedure called ridge augmentation restores the natural hard and soft tissue profiles so that the replaced teeth look much more in harmony with the natural teeth. There are many different techniques of ridge augmentation and the actual procedure used will depend on the volume of tissue lost and also final restorative therapy to replace the missing teeth. This procedure can be carried out under local anaesthetic and depending on the size of the area to be filled can either be done with small bone graft or a soft tissue graft taken from the roof of mouth. 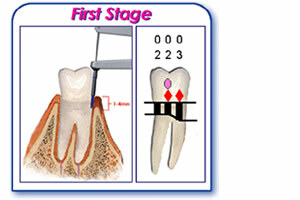 You will be given a choice of materials to be used in the bone graft. The bone graft can either be taken from the patient (back of mouth) or usually from an either animal source (Bovine Bio-Oss) or synthetic material (Straumann bone ceramic. The bone graft helps to provide a stable base for the dental implants and gum tissue by bonding with the natural bone over a period of several months. After it has matured then the bridgework or implant therapy can be carried out. The healing period can vary and the success rates are very high but smokers are advised to refrain from smoking for at least 1 week prior to the procedure and for 3 weeks afterward for the best results. In some more advanced cases both hard and soft tissue grafts are used together. 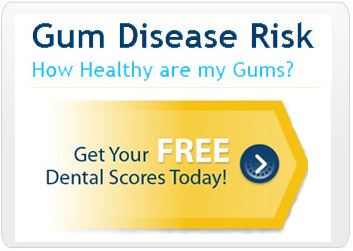 To understand this we must look at what causes gum disease in the first place. The cause of gum disease (gingivitis and periodontitis) is bacteria (bacterial plaque) inside your mouth which has overgrown. This is known as the indigenous bacteria i.e. it comes from own body. Just like the bacteria which we have inside our gut. The treatment for plaque induced gum diseases is all aimed at reducing the bacteria above and below the gum. However, we cannot get rid of indigenous bacteria, as this resides in our own body. That’s why antibiotics have only a limited effect in reducing the symptoms and the effect does not last more than a few weeks. All of periodontal treatments are aimed at reducing plaque bacteria to such a level that it does not become harmful and cause any further problems. First line of periodontal therapy is called non surgical treatment. 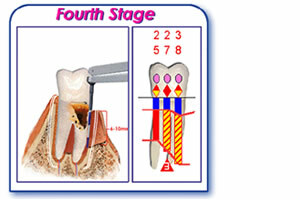 Firstly we need to reduce the plaque build up above the gum by improving brushing & flossing techniques. Then any hardened deposits of plaque bacteria (called calculus or tartar) are removed both above and below the gum line by the use of both hand and ultrasonic instruments. Finally any fine deposits of bacteria and calculus are removed from the root surface with the use of specialised hand instruments called gracey curettes. In addition any teeth/tooth which have moved out of position and cause any problems with the bite may be adjusted (occlusal adjustment). 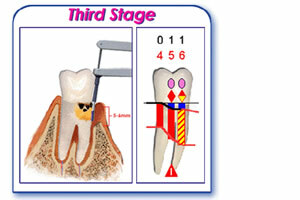 A reassessment is carried out approximately two months later to check the success of the treatment. 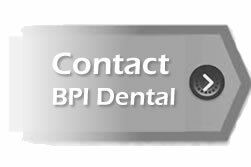 The vast majority of cases we have treated at the Birmingham Periodontal & Implant Centre show at least 90% improvement in reduction of pocket depths. Almost all of the bleeding gums should be eliminated and in most mild to moderate cases this should be all the treatment that is needed. At this visit if we still find problems, then there is the option to have gum surgery. Gum surgery enables the periodontist to see the actual roots and bone surrounding the roots and also to remove any plaque/calculus deposits and any infection. 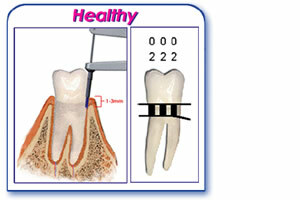 Secondly the gum could be lowered to completely reduce the periodontal pockets also. The final phase of any periodontal treatment is called maintenance therapy. 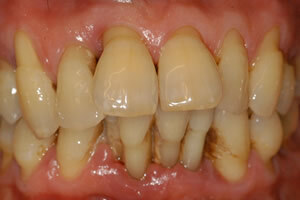 Here 3 monthly hygiene appointments are arranged and professional cleaning above and below the gum line is carried out. Periodontitis needs to be treated like other chronic diseases such as diabetes and high blood pressure which cannot be cured but can be controlled by medication. The medication for periodontitis is good home care and regular professional hygiene visits. With this regime one can expect to keep their teeth for hopefully rest of their life. 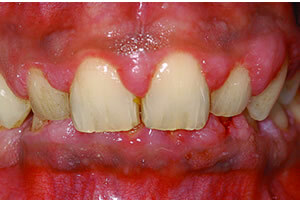 Severe Chronic Periodontitis together with drug induced gingival hyperplasia (Nefidipine). After liasing with the General Medical Practitioner to change medication, the patient underwent a full course of non-surgical therapy. Both signs and symptoms are actually something that is abnormal to a healthy person and usually indicate that there is a medical condition developing. The difference between a sign and a symptom however is that a symptom is usually something that a patient experiences and can describe, for example; my gums bleed when I brush my teeth. A sign on the other hand is an observation a periodontist makes upon an examination, a clinical discovery that proves that there is indeed gum disease present. For example a periodontist would notice gingival recession or periodontal pockets. Do you have gingivitis? This is what you should look for! It is important to note you may have periodontal disease and not experience any of these symptoms. Periodontal disease is silent and chronic, rarely giving an advanced warning that tissue destruction is taking place. That is why it is important to have regular dental checkups. Changes in appearance are usually described according to colour, shape, size, consistency and surface characteristics. 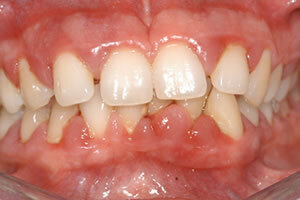 Healthy gingivae are pale pink and the edges of the gum line tightly hug the shape of the tooth. Gingival inflammation usually starts between the teeth and gradually spreads around the tooth margin. The infection causes the tissues to become red and swollen and the fine definition and tone of the gingivae is lost, they eventually become smooth and glossy. 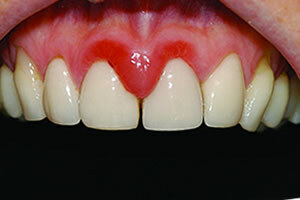 Gingival bleeding is probably the most frequent patient complaint. Unfortunately, bleeding is so common that some people may not take it seriously and even believe it to be normal. Bleeding is usually evidence that bacteria is present and an infection has begun. It occurs most frequently while brushing the teeth. Bleeding may also be provoked on eating certain hard foods such as apples. Patients can taste blood and it may even be smelt on the patients breath. Residual food deposits especially such things as garlic, curry, onion etc….represent the most common cause of halitosis. For example garlic that is absorbed in the intestines is then taken into the bloodstream and finally exhaled by the lungs, so the odour can be smelt long after the food has been consumed. Bacterial infections in the respiratory tract, nose, sinuses, tonsils and lungs can cause an embarrassing smell as can diseases of the digestive tract. Mouth odour is common upon waking up and between meals and is associated with food stagnation and reduced salivary slow. Metabolic diseases such as uraemia and diabetes give characteristic smells, such as the odour as acetone in the case of diabetics with an increase in blood sugar levels.